The first one I received was defective as it would pop open when my dog pulled. Hot Dog Collars promptly replaced it with one that works great. As collars go, it does the job. A basic collar. These lightweight, easily adjustable collars, available in a wide variety of bright colors, are ideal for identifying individual puppies in a litter. We raise coonhounds and are delighted to have found hotdogcollars. I love this collar. Only thing is i wished the pink was a little bit more pastel or baby pink than hot pink in color. but otherwise its great. Pretty collar that matches the description. I have bought this product in different colors along with the matching leashes. The only complaint I have is that the material is a little thin, but still secure. very nice, looks pretty sturdy. I am very pleased with this collar, perfect fit and good quality. 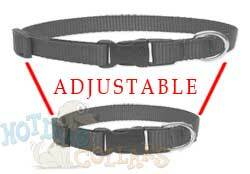 I have ordered several collars from this site and am always pleased with the product, prices and service!